Good idea. But you can do the same thing driving dtr and/or rts directly from code in a controlled loop. And more power, if you want, because you can tie them together. Did that in vb6 long time ago. Though I used it to get higher dc voltage via charge pump. I also use DTR and/or RTS direct control from, to control directly small DIP reed relay in simple PC automation project. Can you provide a link please? That sounds like a good read. Why does anything here to do with SDR include this sort of thing? I’m sure I can’t be the only one who finds it all a bit tedious. Probably because few people even knew what SDR was before then? And since RTL-SDR hit the scene we’ve seen such an explosion in interest that we now have stuff like the LimeSDR and HackRF? RTL-SDR is like MakerBot. 3D printing existed before MakerBot, but it wasn’t practical for the masses. Once it broke that limitation, the market was flooded with new options. Honestly if you don’t know how important RTL-SDR was to putting this kind of tech in the hands of the average hacker, you probably don’t know enough about the situation to even be commenting. I know what SDR is. I just wanted to point out that perhaps not everyone is as excited about it as you are. It’s like someone continually raving on about their favourite band without realising that maybe not everyone is into them. Be enthusiastic sure, but calm down with the “everyone knows this is the best thing ever invented”. I was a bit surprised that bit of hyperbole came from someone other than Benchoff. If on the other hand your saying SDR in general doesn’t interest you then OK, but why did you click on an SDR article and feel the need to comment then? Would you have done the same to somebody posting about a band you didn’t like to use you’re own example? Affordable, more capable, “proper”* SDR. *Actual chips made for SDR, not hardware tricked into being SDR. >…not hardware tricked into being SDR. the first four letters in the title of this site begs to differ. Makerbot? Really? They helped but I think you are giving them WAY too much credit. If by masses you mean the maker/hacker sub-culture then Makerbot was second to the party. There were a lot of people building RepRaps while Makerbot was just a gleam in Bre Petis’s eye. If by the masses you truly mean all the every-day average people then no way! 3d printers STILL haven’t reached most households even now! They may feel like old news to us but they are nowhere near commonplace even today. Frankly, they aren’t ready to be either. There is still too much tweaking and maintenance involved in their use for that to be a thing. Your typical non-techincal person, plucked randomly from the masses will probably be stressed out just over adjusting the tram of the bed. Imagine how they would handle their first clogged hotend! But… people are starting to THINK that 3d printers are mainstream. I wonder how many will be gifted this Christmas. I predict a whole lot of almost-new printers on Craigslist/Ebay this coming February all in need of just a little “basic” maintenance. Come to think of it.. if anyone has a used printer they might want to sell… they had better do so NOW before this years gifts hit the resale market! Anyway.. Makerbot. Yah, they were first to sell kits and pre-built printers to the maker community (not the masses). That was big but I’m sure it was bound to happen sooner rather than later with or without them. These days their products are mediocre at best compared to the rest of what is out there and they are no longer their own company. Instead they are an arm of Stratasys, the company that sat on 3d printing technology for 30 years and never bothered to market it to anyone with less than a 6 digit budget. That’s really not something worth romanticizing. Your absolutely right. its only really much of a thing in the “maker” communities, and not nearly as much as some make it seem. Get out in the real world of electronics/radio development, and people could give a rats a$$ less really. You see this sort of thing a lot in the “maker” communities. Even products that have been used for many years outside of “maker” communities, get similar treatment once somebody attaches it to an Arduino or Raspberry Pi. Its very odd, and has a tendency to set these folks back some actually. I mean, all we need is an article on balancing robots or printed CNC machines to take the next step in the maker revolution. Of course it’s only revolutionary to hobbyists, commercial products 1) have little use for SDR to begin with since most radio implementations are specific to that application and 2) can afford real hardware. RTLSDRs are huge because for $10 anyone can access a whole world of radio receiving that was previously inaccessible. Remember when the RTLSDRs were first discovered the cheapest SDR you could buy was the USRP which at its cheapest configuration was several hundred dollars. yup, you’re the only one. I’ll bet you [Ted] is not a licensed amateur radio operator. If he was, I don’t think he’d be transmitting a 631kHz fundamental just to control an RC vehicle on its 43rd harmonic. While his technical knowledge appears to be sufficient, he needs a handle on the legal and compliance portion. I would highly recommend he pursue a license before continuing on with these experiments. While I think this type of research is valuable and interesting, the fundamentals and harmonics of the square waves he’s producing are trampling all over existing licensed frequencies and running afoul of FCC rules. He needs to be performing these experiments in a faraday cage or via a closed RF system where he can control or prevent OTA emissions. The last thing we need is for the FCC to knock on his door, confiscate his equipment, and fine the bejeezus out of him. A bandpass filter should be an absolute requirement for proceeding. IMO as long as he uses the device without an amplifier he will not do something illegal. He just transmit some characters over a UART. Normal FTDI cables also have 1m of wire connected to the output of the chip. Of course filters are good and an absolute must if he uses any kind of amplifier and he should confine his activities to ISM frequencies without a license. And it’s good practice to reduce unnecessary emissions as far as possible, e.g. do measurements with a closed circuit at a dummy load or attenuator. This reminds me of an article, I think in Dr. Dobbs, about using a UART to output audio. 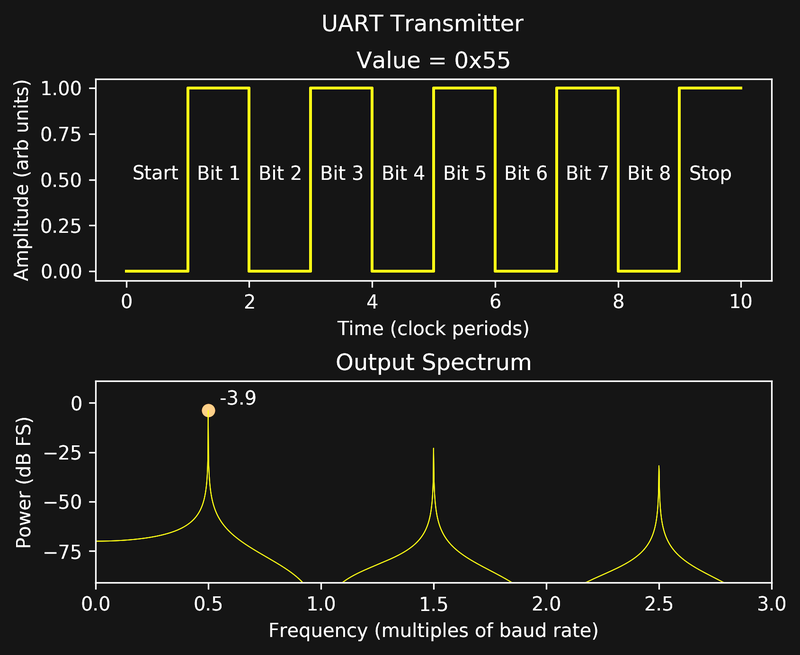 A simple d/a, the pulse width varies by changing the byte sent to the UART. It was a neat trick then, and appropriate for audio. This is stretching things. You’re right, there are solutions that “work” but which have other problems. Forty year ago, people would describe well thought out “rf modulators” to get your video signal into a TV set. Then someone showed a ttl Schmitt trigger as an oscillator, modulated by the video signal. It relied on harmonics to get the right radio frequency. The author at least recognized the problem, but it was “cheap and easy”. “The last thing we need is for the FCC to knock on his door, confiscate his equipment, and fine the bejeezus out of him.” Fortunately for him, FCC enforcement these days is almost nonexistent. One has to really create quite a ruckus before the FCC will even notice. Even when the FCC decides to take action, it often takes a decade or more for something to actually happen, if at all. Well, this is easy to figure out. FCC license search, put in [Ted]’s last name, which we find by clicking the first link in the article (Yapo), and there’s a Theodore Yapo, KB1HFQ, listed. Not sure if it’s the same guy, but possibly. The beauty of licenses being public information. And its probably Part 15 anyway — it can’t be radiating that much out of an antenna off of an FT232. There is nothing even remotely questionable here. Troll be gone! Not once in this article or in the comments has anyone explained what SDR means. Ah, you’re right! Sometimes acronyms feels so common we forget to explicitly detail their meaning at least once. SDR is Software Defined Radio: a modern method of configuring a radio transmitter or receiver using software, rather than needed to swap out hardware to make the same changes. I’ve added an explanation of the acronym in the preamble of the article. Thanks! I guess this happens to everyone sometimes. To prevent/circumvent this HaD could implement a list of words/phrases/abbreviations that are automatically linked to explanations (Wikipedia and so on). But if I remember correctly this was already proposed several years ago in similar comments…. Something browser-side that can be done with a scripting extension. Either I’d need to teach such a script myself which makes it mostly useless OR it uses the first Wikipedia hit or meta page which is often just as useless especially for abbreviations. And the general concept of applying something repeatedly thousands times over at many clients instead of once at the source is energetically and ecological not a good idea IMHO (unless the amount of transmitted information/data increase unreasonably). And if everyone who doesn’t know such abbreviations searches for it manually it’s even worse because it’s time consuming on top of the other reasons. We really insist on the expansion of uncommon acronyms, so no glossary should be necessary. SDR is somewhere in-between — must be known by all radio freaks, but probably not common in the general public. Who is the target audience of this story? I’m going to ask this here also since I need to read into this question I have more. The question I have is because I was wondering why there are no USB 3.0 chipset bridges say like for example using the FT60x or other chipsets that are under $10. There are Broadcom USB 3.0 to SATA that are even cheaper. I’m thinking a USB 3.0 or faster like this would be even more impressive and capable of a system and Ted Yapo knows what he’s talking about also. He’s impressive. Would be interesting to have a USB 3.0 bus pirate or even since the chips have the capabilities within looks like I2C, UART, etc. Is the market supply still too high with the USB 2.0 bridges, so no one wants/needs to hack their devices to USB 3.0? This came from me looking into USB 3.0/2.0 to Fiber Optic adapters/bridges and wondering why the hen they’re so much still? The RCA to Fiber Optic cheap ones seem like they can be hacked into a cost effective USB interface. I’m going to look into this more since I have two of the RCA to Fiber Optic cheap ones (at least if they work since they’re cheapo ones I picked up on a dehumidifier eBay purchase where the dehumidifier evaporator was clogged or the system is low on refrigerant so I got a refund and he let me keep the systems). I find SDR interesting, because there is a lot of wireless devices out there, and there are safety and security concerns. Seems like SDR would make it possible for anyone with a laptop and a dongle, could pretty much intercept any signal, any band, and use what he finds as he pleases. Remote entry in to cars, or garages, homes they don’t own? Hijack someones drone, or other RC ‘toy’. How about block, or over-ride a weaker signal. Sure it’s a tool, but there are a lot of ways to abuse it, and radio seems to have relied on hardware to keep it secure enough. Now the hardware is the software on a laptop, and just needs to be written to exploit the weakness. Laws are like locks, only stop honest people. It is pretty cool, to think one device could eventually handle your every wireless need. Just need to work on those front-ends. There’s a slew of projects out there that generate a radio signal by bitbanging a digital output. It’s a horrible idea because of the harmonics and interference it causes, but there’s a ton of them. Any switching output generates RF. Any. This has been known for a really long time, and at least as long ago as the 1960’s people developed programs to play music when an AM radio was placed near a mainframe computer. There are some elements of basic civility which people engaging in experiments with this should engage in, because yes, you really can be heard at great distance in some cases, and you interfere with other people’s communications.. Constructing a filter on your output to restrict it, as much as possible, to your desired frequency is one. Just read about LC circuit design. Wires are antennas. Yours should be resonant on your desired frequency, so make it about 1/4 wavelength long and give it a ground plane with 3 or 4 elements of the same length. The web will teach you of these things, or what, you don’t have “The Radio Amateur’s Handbook”? It’s a hacker essential. Do not put a very long wire on your output, or you will spew interference on many frequencies and disgruntled hams may make you a target of direction-finding, etc. He needs to eat a lot of crow pie. Pi filters! This is as bad as a spark gap transmitter, like the ones hanging on power poles all over town. I get a lot of RFI from them all the way up on the FM broadcast band. yeaaa science! <3 all the wacky airgap stuff anyone can shake sticks at.